Just when it seemed like the outlook for renewables in California couldn’t get any brighter, the state legislature has passed a bill that will open up access to the 75% of its residents unable to install clean energy on their property. SB 43, also known as the “shared renewables bill” passed the State Assembly and Senate yesterday, and now heads to Governor Jerry Brown for signature into law. The bill immediately creates the largest shared renewables program in the US and could supercharge California’s clean energy economy — all without any state subsidies or extra costs to non-participating residents. 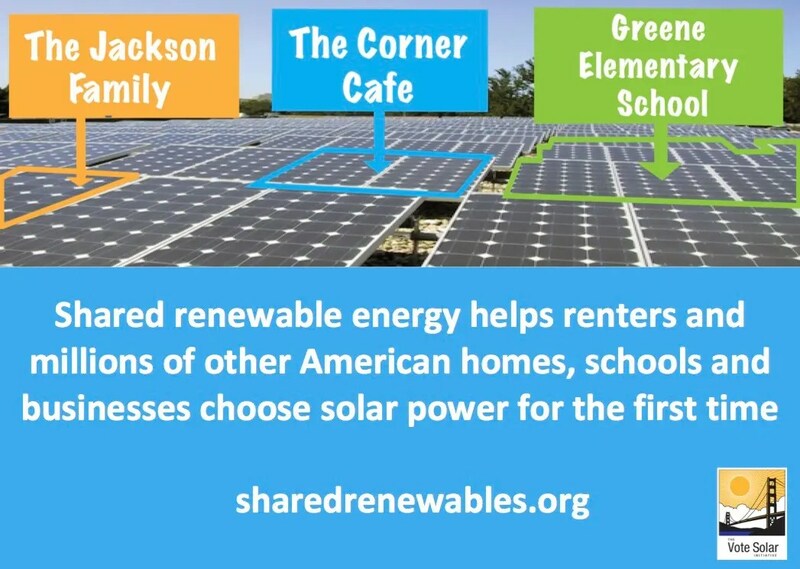 California’s Green Tariff Shared Renewables Program, as the shared renewables program is officially called, allows any customer of the state’s three largest utilities to purchase up to 100% renewable electricity for their home or businesses. Cumulative investments will be capped at 600 megawatts (MW) and the program will sunset in 2019. For context, California installed 521MW of solar during the second quarter of 2013 — an all-time record for any one state in a three-month period. Considering any new renewables capacity created by the shared renewables program would be in addition to the state’s 33% renewable portfolio standard, this could theoretically push the state’s annual solar installation record further than ever before. Buying renewable power on the electricity market isn’t a new idea, but California’s shared renewables program and the customers it would reach bring a few new twists to the scene. To start, the program targets people without property suitable to install clean energy systems – renters, business owners who lease offices, those with shaded roofs, people in homeowner associations, and so on. “SB 43 will allow the millions of Californians who cannot install their own solar unit, windmill, or other renewable power generation system to obtain renewable energy through their utility,” said State Senator Lois Wolk, who sponsored the legislation. Consumers from Pacific Gas and Electric (PG&E), San Diego Gas & Electric (SDG&E), and Southern California Edison (SCE) will be able invest in renewable energy by buying shares of the electricity generated by new projects up to 20MW in size, at a locked-in price that’s added to their existing electricity bill as a credit. Since the subscription price includes a credit to the utility for grid use, any increased transmission and distribution costs aren’t spread to other ratepayers who may not be participating in shared renewables investments. And, the program avoids the fight over net metering because utilities aren’t worried about paying ratepayers back for power they generate but don’t use themselves. While the program is capped at 600MW total, 100MW of that total must be reserved for residential consumers ,and 100MW of new renewable energy projects less than 1MW in size must be built in disadvantaged communities – two provisions that generated a diverse band of support as the bill wound its way through the legislature. Advocacy organization Vote Solar estimates the bill will create around 6,000 new green jobs, allow 20,000 residential ratepayers to participate, and generate over $2.2 billion in economic activity within just a few years. California added more than 9,000 green jobs in second quarter of 2013, so while the state didn’t need any help holding onto its lead as the epicenter of America’s clean tech market, shared renewables could cement that status for years to come. This article, California Passes 600MW Shared Renewables Program, is syndicated from Clean Technica and is posted here with permission.